A lot of marriages fail because the husband or the wife or both failed to live their lives under The Story of God written in the Bible. What is this Story? And what does it have to do with the love story of a man and a woman who committed themselves in a life-long covenant called marriage? Let us look at this Story in four major chapters – Creation, Rebellion, Rescue, and New Creation. Then, let’s look at how that Story changes the way we look at marriage and the way we live our married life. The opening two chapters of the Bible (Genesis 1-2) tell us that God created everything. “In the beginning, God created the heavens and the earth” (Gen. 1:1). He is the Creator. The Story of God is the Story about God. Everything in his creation is from him and, therefore, for his glory. He created man and woman “in his image” (Gen. 1:26, 28). Not man alone. Not woman alone. But man and woman. 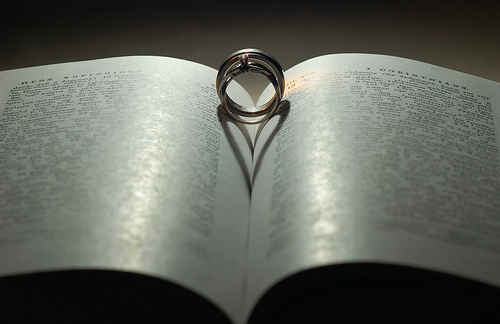 Marriage, therefore, must be a reflection of who God is – his glory, his greatness, his goodness, his grace. Marriage is not a place to showcase one’s self. If a husband or a wife thinks that their marriage is about them – for their self-promotion and self-interest – then they are not living according to God’s design. They become rebels in God’s Story. Our rebellion started in the Garden when Adam and Eve chose to disobey God and believe the lies of the serpent (Gen. 3). Because of that rebellion, sin entered the world resulting in toilsome labor, pains, conflicts, and death. Sin spreads to their children and to their children’s children (Gen. 4-11). We live in a world filled with people (that includes every one of us) who love themselves more than God and other people. Marriage, then, is a union of two rebels. We value self more than the other. We are self-centered by nature. Even our expressions of love are tainted by sin. Marriage is far from being a fairy tale romance (“And they live happily ever after”). You and your spouse need to face the reality of sin everyday – your own sin and that of your spouse. You must learn to admit that you are the problem and not just your spouse. You need to learn to forgive. You need to accept and understand each other. You need to help each other recognize your need of the grace of God everyday. You need to be rescued from yourself everyday. You cannot do it by yourself. Your spouse cannot rescue you like a prince taking up his sword to kill the dragon and rescue you from captivity. There’s only One who can do that. Beginning in Genesis 12, God set in motion a plan to rescue us from sin and death. He made a promise of blessing to Abraham and his descendants that through the nation Israel, a Savior and a King will come. That’s the story of the rest of the Old Testament. Then, God fulfilled that promised rescue through Jesus, “the son of David, the son of Abraham” (Matt. 1:1). He lived a perfectly obedient life – unlike Adam and Eve and the rest of us. He died on the cross in our place – to pay the penalty that our sins deserved. On the third day, he rose from the dead to proclaim victory over sin, death and Satan and that those who trust in him will have life and be restored in a good relationship with God. Jesus is the only Way (John 14:6). He is the only Mediator between God and man (1 Tim. 2:5). He is the only Savior. So, don’t treat marriage as a means to rescue you from your miserable single life or your abusive father. Don’t look at your spouse as your savior. When you turn marriage for your own rescue – you will be disappointed. Or when you see yourself as the rescuer of your spouse, you will fail. Turn to Jesus everyday. Help each other turn to Jesus everyday. He is the Hero in God’s Story. He is the Hero in your own love story. Problems will still come even for those who trust in Jesus daily. Conflicts are inevitable. As long as we still struggle against the presence of sin in our hearts. But don’t lose hope. Your hope is not in each other’s strength or faithfulness but in God’s enduring promises and the power of the Spirit at work within us, transforming us “from glory to glory” (2 Cor. 3:18). Until we see the end of the Story…or the beginning of a new one. One day, as the closing chapters of the Bible tell us, Jesus will return for his bride. There will be a Grand Wedding. We will see Jesus face to face. That’s our hope. No more tears, no more sin, no more death, no more pain. At that time also, marriage will be no more (Matt. 22:30). That’s the “great mystery” Paul was referring to in Ephesians 5:22-33. The union of a husband and a wife is only temporary. It is but a shadow of the great things to come – the union of Jesus and his Church, of God and his people. So, don’t make marriage as your ultimate goal in life. Marriage is good, it is very good. But don’t turn it into a god. Don’t make an idol out of your marriage. Remember that “the chief end of man (and woman) is to glorify God and enjoy him forever” (Westminster Shorter Catechism). God is your highest joy. When marriage is no more, when you no longer have a spouse to enjoy and live your life with, you still have God. That’s your hope when your marriage fails. And even when it is working so well, may it point you toward the Author of your love story. May your love story – imperfect and broken – be a showcase of this one glorious Love Story.